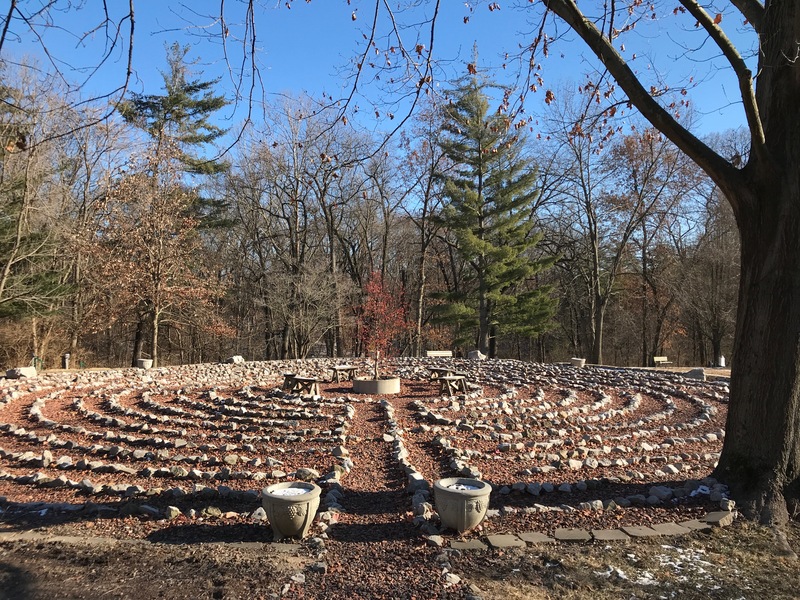 One thing I noticed on New Year’s Day: When walking an outdoor labyrinth in a 2° chill, you can pretty much count on having the sacred pathway to yourself. To be sure, there was plenty of ‘community’ in the immediate vicinity: Gerri and I were two of the 40-plus souls who took part in the New Year’s Eve Retreat at King’s House in Belleville. Our first time to take it in, but the overnight event is something of an annual tradition at the center from what I understand. And every one of my fellow retreatants had the good sense to stay indoors…as they reflected on the blessings of the past year and contemplated their hoped-for changes in the year just-now-dawning. ‘But what’s a little cold?’ I said to myself as I bundled up and ventured out, alone. In truth, I wasn’t even heading toward the labyrinth – not on purpose. Rather, something just seemed to draw me in. A chance to ‘get in my steps’, perhaps, without wandering too far from the building? I did know I had some sorting out to do – reflecting on an odd coincidence in my spiritual reading from the night before. I’d brought along a book, you see: A Christmas present – The Quantity of a Hazelnut. Just a couple of pages into Fae Malania’s marvelous little collection of essays, I learned that she had lifted its title from the writings of a 14th-century mystic, Julian of Norwich. Curiously, as I rummaged through another pile of reading materials later in the evening, I came across the originalessay, written by Julian herself. A puzzling concept. An even more puzzling coincidence. That’s some of what I had rattling around in my head as I made my way into the labyrinth. Before long, though, I noticed that most of my high-level brain activity had ceased. 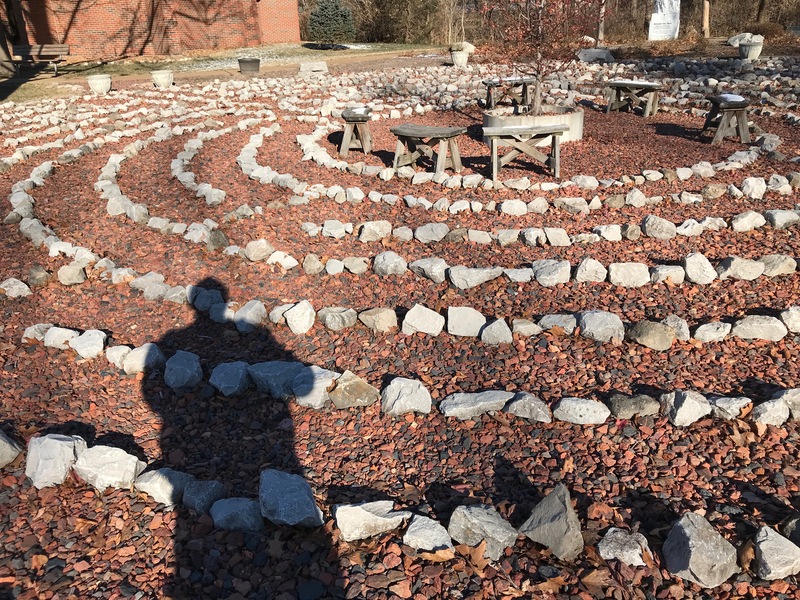 I became focused instead on the physical activity in which I was (foolishly) engaged: making my way through the elaborate layout – eleven circuits around the labyrinth’s center. Four or five circuits in, I took note that the exposed skin on my face was starting to become uncomfortably cold. I soldiered on, alternating between thoughts of mortification and folly. Reaching the center, I was rewarded with a simple gift – profound awareness of the beauty of the morning: both the bright blue sky, and the long sharp shadows cast by an otherwise ineffective sun. Alas, having reached the center of the labyrinth, there’s still half the journey to be done. And by then, I was really getting cold. I didn’t want to ‘cheat’ by stepping across the stones to short-circuit my exit, but I did pick up the pace. Rushing along, I almost missed it. Not Julian’s nut, nor Fae’s. But a nut nonetheless – poised there, in the very center of my path. How about that? God shewed me a little thing on the first day of 2018: A wink. A nod. A gleeful presence, in the sacred stillness of a cold winter’s morn. A seed of contemplation: Happy New Year, 2018!